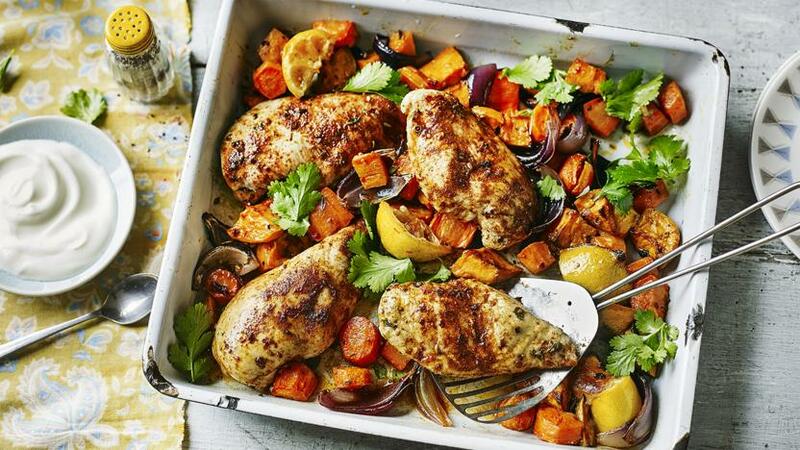 Replace potatoes with root vegetables to reduce the carbohydrates in a chicken traybake and add plenty of spice to turn up the flavour. Each serving provides 361 kcal, 44g protein, 30g carbohydrate (of which 14g sugars), 5.5g fat (of which 1g saturates), 7g fibre and 0.5g salt. Preheat the oven to 200C/180C Fan/Gas 6. Put the sweet potatoes and carrots in a roasting tray, drizzle over the oil and season well with salt and pepper. Roast for 10 minutes. Add the red onion and garlic and toss well. Roast for another 20 minutes. Put the chicken breasts and lemon quarters in the roasting tray in a single layer. Sprinkle everything with the ras-el-hanout and thyme. Roast for a further 15-20 minutes, or until the chicken is cooked through. Stir through the coriander. To serve, divide between four plates, each with a slice of roast lemon for squeezing over and a tablespoon of yoghurt. This recipe also works well with. Follow the recipe but instead of the sweet potatoes and carrots, thickly slice 2 courgettes, 2 aubergines, 1 red pepper and 1 yellow pepper and add in step one. In step three, instead of the lemon and ras-el-hanout add 15 halved cherry tomatoes with the chicken and thyme. Bake as per the recipe, but do not stir through the coriander or serve with the yoghurt. Follow the recipe but instead of the sweet potatoes and carrots, thinly slice 600g/1lb 5oz new potatoes and 2 green peppers and add in step one. Roast for 20 minutes in total and omit step two. In step three, instead of the lemon, ras-el-hanout and thyme add 1 teaspoon dried oregano, 2 sprigs fresh rosemary, a small bunch of asparagus and 1 tablespoon pitted Kalamata olives with the chicken. Bake as per the recipe, but add 200g/7oz sliced halloumi for the final 10 minutes of cooking and do not stir through the coriander or serve with the yoghurt. Follow the recipe but instead of the sweet potatoes and carrots, dice 2 aubergines and peel 2 garlic cloves and add in step one. Roast for 30 minutes in total and omit step two. In step three, instead of the lemon, ras-el-hanout and thyme, add 20 halved cherry tomatoes, 2 teaspoons capers, 1 tablespoon pitted black olives and a drained 400g tin cannellini beans with the chicken. Bake as per the recipe, but tear over fresh basil leaves and do not stir through the coriander or serve with the yoghurt. To find out more about type 2 diabetes and get information on how to reduce your risk of this mostly preventable disease, read our article.